When it comes to school safety our students and families are our greatest assets. When you see something, say something! This year Staunton Schools have partnered with The Safe School Helpline as a free and confidential way for you to report bullying, school threats, or seek assistance with mental help 24/7. By using the helpline you can let us know anonymously when you know of anything that threatens the safety of our schools. Students and our families deal with problems that arise at school frequently. Most of us do the right things for the right reasons all of the time and want to help our schools continue to improve. At times, students and families overhear information that they may not feel like they can share or they don’t know where to share it. When someone steals, uses drugs in schools, bullies, threatens violence, or commits illegal actions, it can hurt all of us. 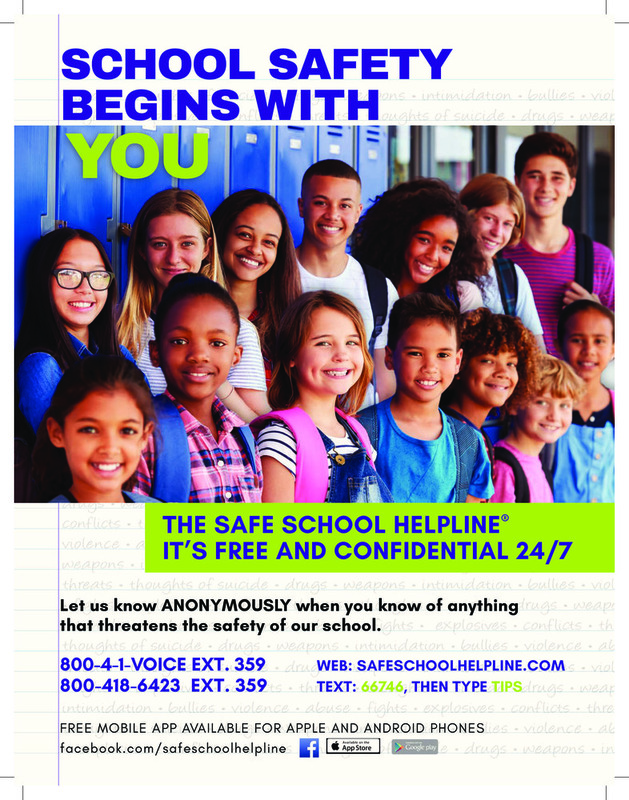 Now you can use the Safe School Helpline to report this information anonymously. We hope the information outlined here will answer your questions and ease your mind so you can help keep our schools a safe place to learn. There is also a free mobile app available for apple and android phones found on our Safe School Helpline page. We have contracted this service through Security Voice, an independent company with no other ties to our school. A toll-free number has been assigned for our school district. When you dial this number from your touch-tone phone, you will be advised how to leave your information. You may exclude your name or other facts that could identify you. Then, record your message. What type of information should be recorded? You may call toll-free anytime, day or night, from a home or cell phone. Take care that your call is not overheard. Can I text or use the internet for reporting? Yes. To text, enter 66746, then type TIPS. To use the web, login at www.safeschoolhelpline.com and make your report. Your phone number and email address will not be shared with your school. Can this help troubled students too? Yes. If you see a student who is troubled, or overhear remarks like “I can’t go on,” please call or encourage the student to call the helpline. The call will be routed to a Counseling and Crisis Center that provides a 24-hour crisis intervention service. Trained counselors are available 365 days per year to talk with persons seeking assistance in coping with suicidal thoughts, depression, or feelings of loneliness and loss. Callers need only press “3” when prompted. After three school days, call the toll-free number and enter your case number when prompted. A recording will let you know your message was heard and may ask you for more information Your answers will be transcribed and sent to the school administration for further investigation. Administrative actions may sometimes be confidential, but your call is always important. Yes. A free mobile app is available for Apple and Android phones at the Apple Store and Google Play. Can I send photos or videos? Yes. You may email photos and videos to images@securityvoice.com. Please reference your case number when sending. This email address is for photos and videos only.